Examining the cover to the 1979 book Future Cities: Homes and Living into the 21st Century you can instantly feel its paleo-futuristic glow. With colonies in space, solar heated houses, amazing sports, (which obviously take place in freefall), and wristwatch TV it's almost too much for just one blog to handle, but we shall try. Stay tuned for more as we crack this book wide open in the coming weeks. A special thanks to JesseM for turning me on to this book series after reading my post about the EPCOT book The Future World of Transporation. I look forward to these posts -- I read the Usborne books over and over as a kid, and most of my friends did too. So thanks in advance for the big chunk of paleo-futuristic nostalgia coming my way! 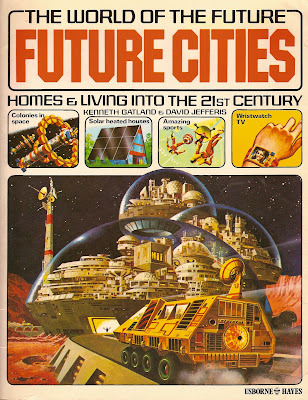 I had the "Usborne Book of the Future" as a child of which "Future Cities" was one of three parts that were also sold seperately as in the example under scruting. TUBotB influenced me profoundly. its vision of a future, almost none of which has come to pass, is for me still the default vision of the future that I was promised when I was young. I want my future back. It was indded: a Lunar olympics in 2020. At the time, it seemed perfectly reasonable. There was description of the Olympic flame being brought from Earth. Zaire as the site of the spaceport seems very plausible. An African astronaut was pictured jogging across the regolith carrying the flame in a sealed container. I just came across this blog and seeing the cover of this book brings back so many memories of it for me. I loaned this book from my public library when I was about 10 and loved it so much. Thank you for making this grown man feel all good inside. I used to have this book along with Future Robots and Transport. Sniff, I don't know where they are now. I loved this book as a youngster, and I still have it. In fact, I still have the entire three parts of the Future series. This book was one of the books that actually inspired me to become what I am today: a town and regional planner. Usborne World of the Future books. I love these books, and many of the predictions did come to pass, I have seen articles in the press which compared the Future Cities book with the present state of cities and many of the predictions, distance retailing, large flat screen TVs, video cameras, email, etc. are a reality. They did an amazon job for 1979.